The approximatly 745m long and 285m wide island in the widely untouched Raa atoll is found just north of the Baa of atoll. The island has a nearly 2 km long sandy beach around it and lush vegetation inside. The house reef is easy to reach from the 2 jetties North and south, from only 80 and 250 m away from the wonderful lagoon respectively. Numerous uninhabited islands and excellent snorkel and dive spots are located very close to the island and can be reached in a short time on one of our boats. 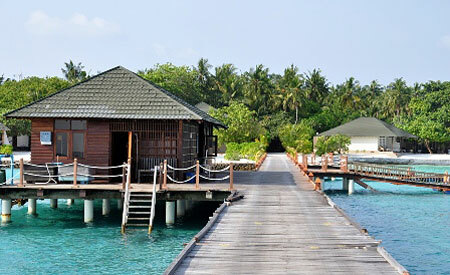 The flora and fauna of Meedhupparu has been maintained in many places in itsnatural form. Beside coconut trees, green bushes and bougainvillea trees dominate and the Pandanus with theirs external air roots impress. Beside the main ways there are still others and especially the small ways between the tennis and the badminton courts are worth seeing. All beach bungalows are arranged a semicircle and everyone has a view of and direct access to the beach. Behind them there is the main connection way. From the south jetty there is a way through the middle of the island which goes around the different tourist facilities. Because the main ways are also used for transports with man transporters and the golf carts, there is firm subsoil rather than a thin sandy surface. Here of course you can walk barefoot - however, to tender feet flip flops are to be recommended, especially on the sometimes very hot wooden jetties. 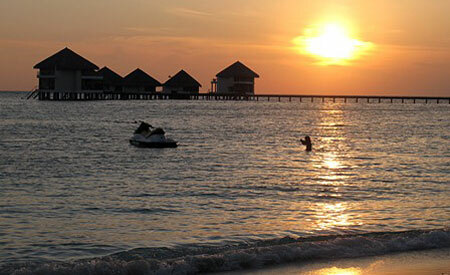 Adaaran Select Meedhupparu offers 215 rooms of different reservation categories all over the island, and, in addition, 20 'Adaaran prestige Water Villas'.